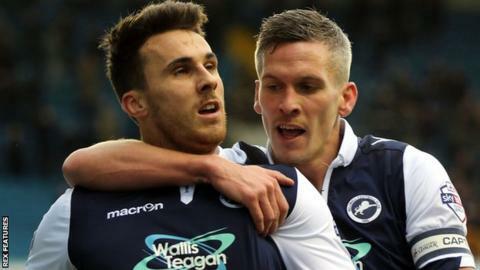 Lee Gregory took his seasonal tally to 17 goals as Millwall inflicted a home defeat on second-placed Walsall. Both keepers were called on to make good saves before Walsall's Anthony Forde rattled the bar from 20 yards. Gregory converted Jed Wallace's cross to put the Lions ahead before debutant Mahlon Romeo made it 2-0, beating Liam Roberts after a one-two with Wallace. Hopes of a Walsall fightback ended when Gregory ran onto Shaun Williams' pass to add Millwall's third. Millwall's unbeaten run is now up to five games, keeping them sixth in League One, only one point behind fifth-placed Coventry, while Walsall remain second despite their fourth home defeat of the campaign. "They're disappointed more with the scoreline than the way we performed. We got caught, I suppose, chasing the game that was always going to be reliant on whoever scored first. "It was always going to be a second ball game, them getting it forward early to (Steve) Morison and Gregory to play off that. "For a large part, we did really well, just couldn't quite get a goal - blocks on the line and hitting the post, hitting the bar, but their spirit was really good." "Walsall are a really good team, but the league table doesn't lie, especially when you get into February. "It was a stern test for us and we had to stay in the game at times and we had to dig in, we had to throw our bodies on the line and I thought we did that. "The youngsters are getting a lot of praise, and rightly so because they're a good group." Match ends, Walsall 0, Millwall 3. Second Half ends, Walsall 0, Millwall 3. Hand ball by Ed Upson (Millwall). Attempt saved. Milan Lalkovic (Walsall) right footed shot from the centre of the box is saved in the bottom right corner. Goal! Walsall 0, Millwall 3. Lee Gregory (Millwall) right footed shot from the centre of the box to the bottom left corner. Assisted by Shaun Williams. Substitution, Walsall. Milan Lalkovic replaces Adam Chambers. Substitution, Walsall. Kieron Morris replaces Andy Taylor. Substitution, Millwall. Joe Martin replaces Jed Wallace. Corner, Walsall. Conceded by Sid Nelson. Attempt missed. Anthony Forde (Walsall) right footed shot from outside the box is just a bit too high. Goal! Walsall 0, Millwall 2. Mahlon Romeo (Millwall) right footed shot from the right side of the box to the bottom left corner. Goal! Walsall 0, Millwall 1. Lee Gregory (Millwall) left footed shot from the centre of the box to the bottom left corner. Assisted by Jed Wallace. Attempt missed. Lee Gregory (Millwall) right footed shot from outside the box is close, but misses the top right corner. Attempt saved. Adam Chambers (Walsall) header from the centre of the box is saved in the centre of the goal. Corner, Walsall. Conceded by Shane Ferguson. Foul by Sid Nelson (Millwall). Byron Webster (Millwall) wins a free kick on the right wing. Attempt missed. Jed Wallace (Millwall) right footed shot from very close range is just a bit too high. Substitution, Walsall. Jordan Cook replaces Tom Bradshaw because of an injury. Sid Nelson (Millwall) wins a free kick in the attacking half. Second Half begins Walsall 0, Millwall 0. First Half ends, Walsall 0, Millwall 0. Anthony Forde (Walsall) hits the bar with a left footed shot from outside the box. Corner, Millwall. Conceded by James O'Connor. Corner, Millwall. Conceded by Rico Henry. Attempt missed. Sam Mantom (Walsall) left footed shot from outside the box is high and wide to the right.